I've resisted Xstreet, formerly SL exchange, for a long time. For those who aren't familiar with it, Xstreet, SL Exchange, SL Boutique and OnRez were or are online marketplaces to buy and sell SL items. Once upon a time I didn't like the fact that it had connections to Anshe and I disliked her approach to business, particularly when she threatened to sell Craig Altman's full perm animations for $10 each. 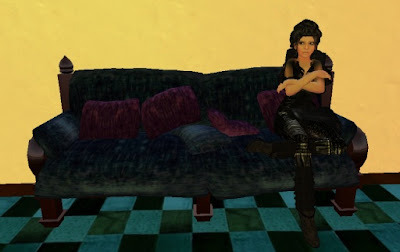 I made an account at SL Boutique, latterly OnRez, but I was very bad at maintaining it. For those who haven't tried to list things on one of these it is almost as painful as invoking the DMCA procedure for removing scammed items: you have to drag an item to a magic box, and then collect a lot of data for the item... how many prims, location in world, permissions, price, name, pictures. Once you have all the information and have dragged the item to the box, you have to set up each item separately, on the website. It isn't difficult to follow the instructions, but it is hellishy boring. I have decided I can cope with four items a day. It made me realise just how much stuff I have in my inventory which I wouldn't want to sell any more. In the course of finding a photograph for one of the items I came across a folder of really old builds I had made... and I realised that I have a large proportion of these still in my inventory. I have kept some really terrible stuff I made in my first year, for sentimental reasons, and a huge amount of old clothing which I no longer sell. As I have the pictures, I am beginning to think I should let the actual objects go... but as in real life, where I have thousands of books and art materials and genealogy stuff cluttering up the place, I find it soo hard to let go of them. Supposing I am one day blessed with half a dozen sims, mightn't I want to get out these things and celebrate my progress? It would almost be a museum to progress in the virtual world. Ah well. If I had six sims to build, I would almost certainly build new stuff, a virtual fantasy world, and not drag crude old items out of my inventory. Maybe I should simply learn to delete.